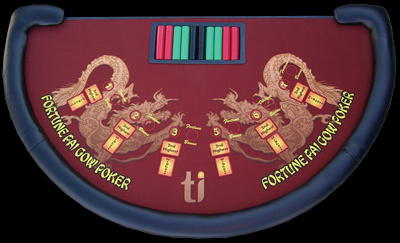 Pai Gow is a centuries old game that originated in ancient China. It was a bit complex and played with tiles that closely resemble dominoes. In fact, many times they were called dominoes, even though they're not. Variations of the popular game started appearing in China in the 1800's. Not a whole lot is known about who exactly invented the variations or when each one came into existence. What we do know though, is that the game known as Pai Gow Poker has its roots in the original Pai Gow tile game, but is not exactly the same. It is a fusion of both Pai Gow and traditional Poker. Pai Gow Poker first started appearing in California around 1986. Within a year, some Vegas casinos began offering a table or two in their casinos. However, it took several years after that for Atlantic City and other jurisdictional casinos to really catch on and start offering Pai Gow Poker as a regular feature. This article uses material from the website gambling-win.com "History of Pai Gow Poker".